Fans of Harold Budd may not recognize him right away on Jane 1-11 (59'16"). In a blindfolded listening test one might guess it to be a very spare work by Roedelius (as each of the 11 tracks were recorded in just one take) or perhaps it is some lost delicate, melodic album by Brian Eno. 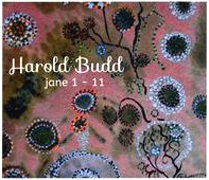 But in truth this is a purely Harold Budd release, one that brings the composer back to his earlier synthesizer works. Dedicated to artist Jane Maru Jane 1-11 celebrates incongruous juxtapositions. Purely through sound Budd explores a different atmosphere and mood on every track. From tuneful, heart opening songs and languorous ambient zones to shifting metallic clouds of sound, each of the 11 tracks on Jane 1-11 produces a unique sonic contour portraying the quiet impassiveness of rest. A few of Budd's signature slow, reverberant piano notes show up here and there, but overall this is an electronic affair - one where the harp and celestia sounds are digital, as are the many unearthly timbres realized through some willful process. But did these 11 pieces come to Budd fully formed, or were they discovered in the act of playing - in some unrehearsed and unscripted act of creativity? Budd does intend this work to be more than expressive arrangements of sound and form. And he so succeeds as the resulting music is deepening for both the listener and the musician.